Dual-Bulb LED Conversion kit fits Harley SoCalMotoGear.com - Professional Grade Motorcycle Lighting - Plug N Play Products - "Riding at night has never been brighter!" Our LED bulbs have been tested and fit checked on HD models and are guaranteed to fit and delivers outstanding performance compared to your stock bulbs. This setup is not only to make you more visible during night time but increases your visibility during the day as well. Keep your stock look and just upgrade the bulbs! 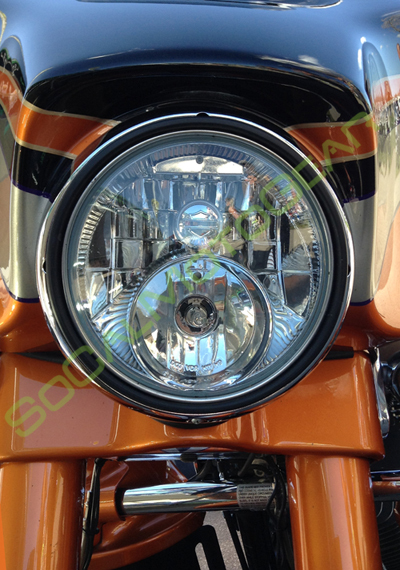 Designed for the new Harley Headlights that uses a Dual-Bulb Top/Bottom Halogen system such as some CVO models, 2014+ Street Glides and certain V-rods. 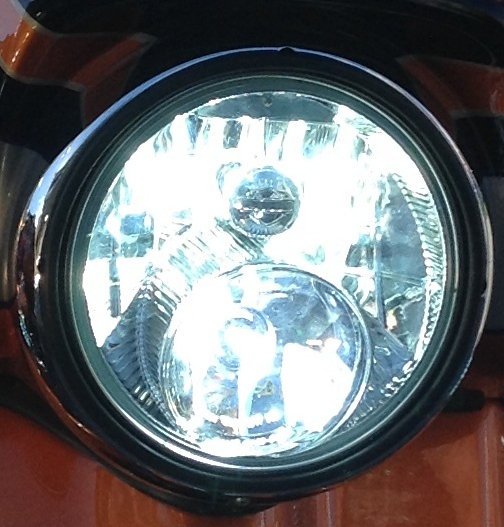 Scroll down and see if your headlight looks similar. This professional Harley Dual-Bulb Kit will completely replace your factory lighting to our LED lighting. This kit will enable you to have LEDs for your LO and HI beams. HARLEY GARAGE DOOR OPENER COMPATIBILITY: LED bulbs may not work with your Factory Harley Garage door opener. Thank you for the support your team gave with installing my led lights. I communicated my issues and got immediate response and product assistance. Easy 5-min install, worked like a champ. Very bright! Very cost effective way to convert to LED. Do not spend over 500.00 for the Harley Davidson Daymaker. Get these bulbs instead. Just as bright, if not brighter, and much cheaper. Easy 5 minute install!! Placed bulbs in my 2014 Street Glide Special. Great product. Very happ. These are so bright and easy to install, they are about 20% of the cost of the Harley daymaker. I am 100% happy and satisified and can see very good for night driving, Plus I can be seen in the daytime. It makes the road signs white even in the day time.